Vancouver, British Columbia–(Newsfile Corp. – April 12, 2019) – Miramont Resources Corp. (CSE: MONT) (OTCQB: MRRMF) (FSE: 6MR) (“Miramont” or the “Company”) is pleased to announce it has received final assays from its 3,679-meter diamond drill program at its Cerro Hermoso polymetallic project located in southern Peru. Results include 249 m of 0.68 gpt Au equivalent including 1.95 m of 28.4 gpt Au equivalent in hole CH-009 (please refer to a table of results below and a nearby plan map showing the location of drill holes). Drilling tested three principal targets, the Central Breccia Zone (holes CH-004, CH-005, CH-006 and CH-009), the Stockwork Zone (holes CH-001, CH-002 and CH-003) and the Carbonate Replacement Zone (holes CH-007 and CH-008). Significant mineralization was encountered in the Central Breccia Zone. Hole CH-009, drilled eastward, encountered 249 m of 0.68 gpt Au equivalent beginning at 103 m including 1.95 m of 28.4 gpt Au equivalent beginning at 153.55 m and a second interval of 59 m of 0.44 gpt Au equivalent beginning at 393.5 m and continuing to the end of the hole. Hole CH-005, situated approximately 100 m north of and parallel to CH-009, encountered 45 m of 0.58 gpt Au equivalent beginning at 378 m. Hole CH-006, situated approximately 250 m southeast of CH-009 and drilled westward, encountered 8.5 m of 2.97 gpt Au equivalent beginning at 308 m including 1.5 m of 15.69 gpt Au equivalent beginning at 315 m. Collectively, holes CH-009, CH-005 and CH-006 demonstrate the presence of a mineralized system within the diatreme that appears open to the northeast, east and southeast under an area of post-mineral cover. The eastern margin of the diatreme lies approximately 600 m beyond the end of these two holes, leaving considerable room for further exploration. A large, sub-surface magnetic feature situated approximately 400 m northeast of hole CH-009 may be an intrusion, potentially related to mineralization. Holes CH-001, CH-002 and CH-003 in the Stockwork Zone encountered narrow intervals of anomalous mineralization. 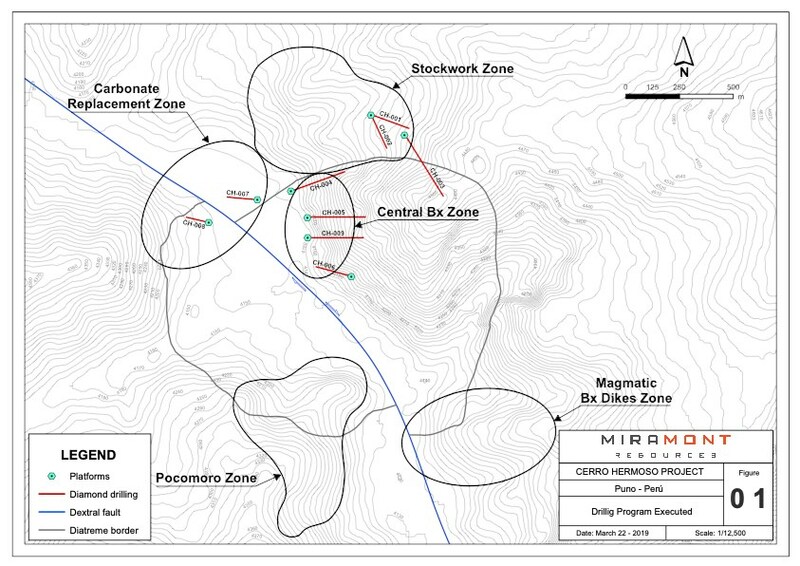 Miramont sees limited potential for broader zones of mineralization in this area. Similar short intervals of anomalous mineralization were encountered in holes CH-007 and CH-008 targeting the Carbonate Replacement Zone, indicating limited potential in this area. 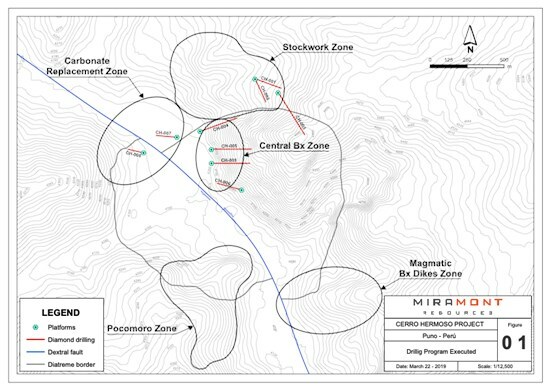 Miramont is currently undertaking a thorough review of results from drilling at Cerro Hermoso with the intent of determining the best path forward. The table below presents anomalous intercepts in all nine diamond drill holes completed at Cerro Hermoso. Some intercepts from holes CH-001 through CH-006 were previously reported in a news release dated March 28, 2019. Assays were completed first by SGS and then by ALS Laboratories in Peru. Future samples will be analyzed by ALS as primary laboratory. Miramont follows rigorous sampling and analytical protocols that meet industry standards. Core samples are stored in a secured area until transport in batches to either SGS or ALS prep labs in Arequipa, Peru. Sample batches include certified reference materials, blanks, and duplicate samples are then processed under the control of ALS or SGS. ALS samples are analyzed using the ME-ICP61 (a technique that provides a comprehensive multi-element overview of the rock geochemistry), while gold is analyzed by AA24 and GRA22 when values exceed 10 gpt. Over limit silver, copper, lead and zinc are analyzed using the OG-62 procedure. SGS samples are analyzed using the ICP 40B method while gold is analyzed by FAA515. Over limit silver, copper, lead and zinc are analyzed using the AAS41B procedure. The technical content of this news release has been reviewed and approved by Dr. Quinton Hennigh, P.Geo., Chairman of Miramont and a Qualified Person as defined by National Instrument 43-101. Miramont is a Canadian based exploration company with a focus on acquiring and developing mineral prospects within world-class belts of South America. Miramont’s two key projects are Cerro Hermoso and Lukkacha, both located in southern Peru. Cerro Hermoso is a diatreme-hosted copper dominant polymetallic prospect. Lukkacha is a classic copper-porphyry prospect.